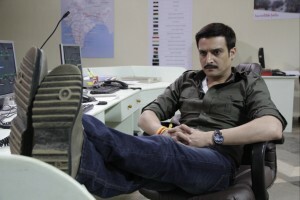 On 4th of January 2013, Jimmy Shergill is back and starring in the Ashok Kohli directed Socio-political drama Rajdhani Express- Point Blank Justice’ . Produced by Manoj Kejriwal, Ritika Kohli & Rajesh K Patel, it has an ensemble star cast of Leander Paes, Jimmy Shergill, Puja Bose, Priyanshu Chatterjee, Gulshan Grover, Kiran Kumar, Mukesh Rishi, Sadhanshu Pandey, Sayali Bhagat, Achint Kaur and Shilpa Shukla. In the film, Jimmy is playing the character of hard-nosed deputy commissioner Yadav in ATS. Currently shooting near Chambal, he gave a candid interview. How did you come on board for Rajdhani Express? I met Ashok ji and he narrated the script to me. Later he also gave me a bound script. I read and really liked the story. I found it very intriguing and quite fit for today’s scenario in the country. So I agreed. He told me the character he wanted me to play. It must have been in the back of his mind that I had played a cop in A Wednesday also. My only request was that he should shoot with me in one go and he kept his word. He wrapped up my portion in 15-16 days. How would you differentiate your character of a cop Yadav in Rajdhani Express from the character you played in A Wednesday? In A Wednesday I hardly had any dialogues and I was following orders of my superiors. I emoted mostly through my eyes, expressions and body language. In Rajdhani Express, I have plentiful of strong dialogues band I make my own decisions. In both the films cop played by me is very strong and aggressive. According to the director Ashok Kohli, your character is the antagonist of the film? Is it not the first time that you are doing a role with grey shades? Why? Isn’t there an antagonist in all of us at some point of life? I think if you look at the film most of the actors are human and have shades of grey. Even in their dialogues it is there. In political scenario grey is there. Yadav is put in a place where he has to handle the situation. And that is what he does. Yadav has been give this power to find solutions and that is what he does. Your working experience with Leander Paes? My track is completely separate but I met him couple of times. He is a sweet guy. It is his first film and I am sure must have done a great job. Most important is the fact that it is a good script. It has the dark humor in it. It has everything that is shown to you in reality. In real life how much do you believe in subtitle of film ‘Point blank Justice’. I think it goes with the story. A vicious circle that the director is trying to showcase through the film. It has the irony and the satire of people’s life experience in it. How was it working with your director Askok Kohli? Very nice. He is very chilled out person. Very much in control of the situation. He is in sync with the film, story and actors. He would discuss the scene before the shoot and was always open to suggestions, which is great. Once we started the shoot, we did it quickly because everything was so clearly worked out before only. Work happened pretty fast. Any interesting incident during the shoot? Mine was mostly indoor shoot in the railway control room where my character Yadav is trying to take hold of the situation. Control room was made next to Marine Lines station. And it was made in such a way that we could see the train passing by. Very strategically designed. It was fun, understanding all the gadgets etc. Your perception of the Common Man? Common man is stuck in a vicious circle. If you want to bring any change in this country then all us need to go ahead and vote. Use the power that you have. That is your first right as a common man and you must exercise this. Which are your coming projects? Special Chabbis of Neeraj Pandey is releasing in February 2013, and Sahib Biwi Aur Gangster Returns by Tigmanshu Dhulia is releasing in March. Then currently I am shooting for Bullet Raja directed by Tigmanshu. Another is Punjabi film Rangeeley with Neha Dhupia and it is produced by me.